When One Piece: Pirate Warriors was released on the PS3, I found myself playing it and enjoying it—despite having next to no knowledge about the source material. If One Piece: Pirate Warriors Is Always This Crazy, I&apos;m In! In other words, going in, I had never seen so much as an episode of One Piece—though I seem to remember having seen one of the movies on a date once. As it turns out, not much has changed since then as Japan has recently seen the release of the sequel game, One Piece: Pirate Warriors 2, and I have still yet to see any more of the show. However, that didn’t stop me from picking up One Piece: Pirate Warriors 2, as I had been looking forward to more of the off-the-wall insanity I came across in the first game. And while the game certainly delivered in insanity, I was sad to see that most of what made the original game so fun and unique had been removed. Luckily for me this time around, the story of One Piece: Pirate Warriors 2 is a “dream story”—an alternate universe story where all of the Straw Hat Pirates but Luffy and Nami are turned evil by a mysterious black mist. Thus, in order to save their friends, Luffy and Nami must team up with their enemies—like Smoker and Perona—as well as with various well-known allies to fight off this mind controlling menace. While not terribly original as far as plots go, it does allow for a lot of fan service. Dream matches between the series’ strongest characters happen one after the other in awesome cutscenes; and the game loves to tease One Piece fans by mirroring the most dramatic moments from the anime/manga and then taking them in a whole different direction. If there was one weak point the original One Piece: Pirate Warriors, I felt it was the lack of co-op when playing through the main story of the game. In One Piece: Pirate Warriors 2, however, all but the prologue missions are available for co-op—and not just local co-op either. Pirate Warriors 2 has a special “rescue” feature. If you want co-op help on any given level, you simply press start and it sends an S.O.S. out to every other player on the chapter select menu. The first one to click it gets to join your game. And after the level is done, you’re off on your own again. It’s a great way to get quick and easy help in co-op if you want it. More so than the first game in the series, Pirate Warriors 2 is very much a run-of-the-mill Dynasty Warriors game gameplay-wise. You mass murder thousands of normal soldiers each level as you conquer zones and fight the scores of bosses that pop up to stop you. That said, there’s nothing inherently wrong with Dynasty Warriors-style games—as I have talked about at length before. And Pirate Warriors 2 does a great job of keeping each level interesting with ambushes, surprising twists, and whole new armies entering the field mid-battle. I was never simply allowed to push straight toward the final objective, and this kept me constantly on my toes. The thing I liked most about the first Pirate Warriors was how it changed up the typical Dynasty Warriors-style gameplay with its action stages. These were part platforming and part puzzle sandwiched in between ambushes by the typical scores of enemies. I was saddened to discover this type of level never appears in Pirate Warriors 2. Don’t get me wrong, the action stages had their downsides in the original—no co-op and you had to play as Luffy—but to see the clever addition of platforming and puzzles completely cut from Pirate Warriors 2 is unfortunate, to say the least. But that’s not the only feature from the first game that doesn’t return. The major boss battles are gone as well. In the first game, the big bosses had multiple life bars and awesome cinematic cutscenes strewn throughout the fight. These battles (and many of the action stages) also had a fair amount of cinematic quick time events. But these QTEs are gone in Pirate Warriors 2 as well. I came away from One Piece: Pirate Warriors 2 feeling that it was a game both better and worse than last year’s One Piece: Pirate Warriors. The inclusion of an original story, co-op, and being able to play as any character on any stage (as long as you have unlocked them, of course) is definitely going to make a lot of people happy. But the complete cutting of the big boss fights, QTEs, and actions stages, makes the game feel much more run-of-the-mill. 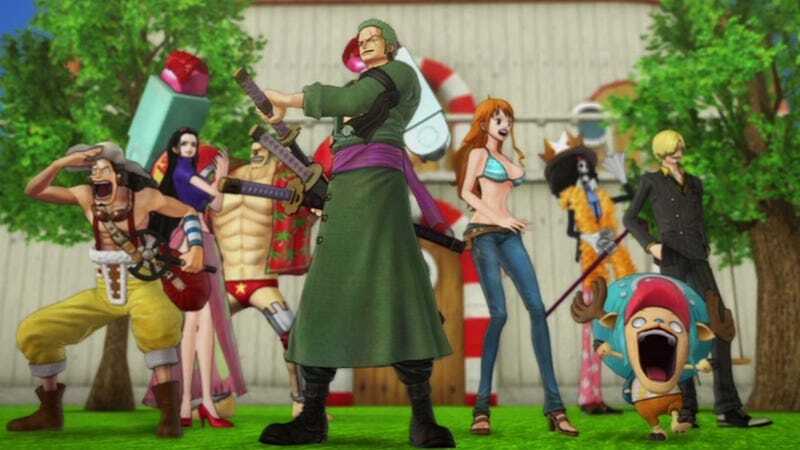 In the end, One Piece: Pirate Warriors 2 is a game that has embraced its gimmick (be awesome as your favorite One Piece character in a Dynasty Warriors game) and doesn’t feel the need to do any more than that. One Piece: Pirate Warriors 2 was released on March 20, 2013, for the PlayStation 3 and PlayStation Vita in Japan. It will be released on the PlayStation 3 in North America and Europe sometime this summer.